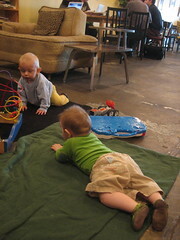 At the cafe today we met two little boys (Cody & Jakin) who were well and truly crawling. 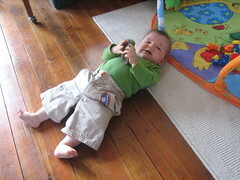 Gus watched them for awhile and when we got home… he started using his feet to push himself forward! Very exciting! Then 5 minutes later I heard his frustrated cry which usually means he’s maneuvered himself so that he’s stuck under the couch. But this time he was simply on his back like a cockroach. He had forgotten how to roll over. Sigh.